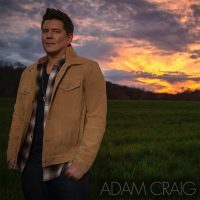 Named one of Rolling Stone’s “10 New Country Artists You Need To Know” (Summer 2016), Stoney Creek Records’ Adam Craig is one of Music Row’s most talented new acts. In addition to soaring vocals, Adam has contributed his songwriting chops to hits like Parmalee’s “Close Your Eyes,” and Love & Theft’s “Whiskey on My Breath.” Adam has also scored cuts by Jason Aldean (“Church Pew or Bar Stool”), Dustin Lynch (“World to Me”) and more. Adam gained critical attention for the clever word-play of his debut single “Reckon” off his self-titled EP. Mixed with his incredible talent for writing, Adam has an uncanny knack as an artist for placing listeners directly into a story. His brand-new “If You’re Lucky,” drenched with nostalgia, transports listeners back to their teenage years in the small-town life, while his poignant “Why Can’t She,” delivers a heathy does of heartbreak. His second single, the blues-tinged “Just A Phase,” cracked the Top 40 on Country radio, proving Country radio is ready for Adam’s sensitive side.